El Niño is already starting to bring heavy rains and severe weather to the Southland this winter. As our public safety officials diligently track the storm system, I urge you to take the necessary steps to prepare for fierce weather conditions. It's not too late to get prepared. After four years of drought and wildfires, LA's landscape is incapable of absorbing large amounts of rain. There is a high potential for flooding and mudslides in vulnerable areas. To help you get ready for all the wet weather, the City of Los Angeles has launched a new website, www.ElNinoLA.com. The site has important information and tools on how to prepare your home for the weather, how to create an emergency kit, how to create an evacuation plan and much more. You can also stay ahead of severe weather conditions by signing up for NotifyLA, a regional alert system that sends emergency alerts through SMS text, voice message and email. The LAPD non-emergency information line is (877) 275-5273. For all life-threatening emergencies, call 9-1-1 immediately. Take a look around your home and ensure that all drains, gutters and downspouts are clean and functioning properly. This is especially important for flat-roofed buildings. Keep pipes, troughs and culverts free of debris. Closely examine windows, skylights and doors that may benefit from caulking or weatherstripping. Inspect your attic for "leaks" of sunlight, or signs of previous water damage that may indicate where repairs are needed. Make sure you have household supplies, like a bucket, mop, towel and tarpaulin to minimize damage from a sudden leak or stormwater seepage. 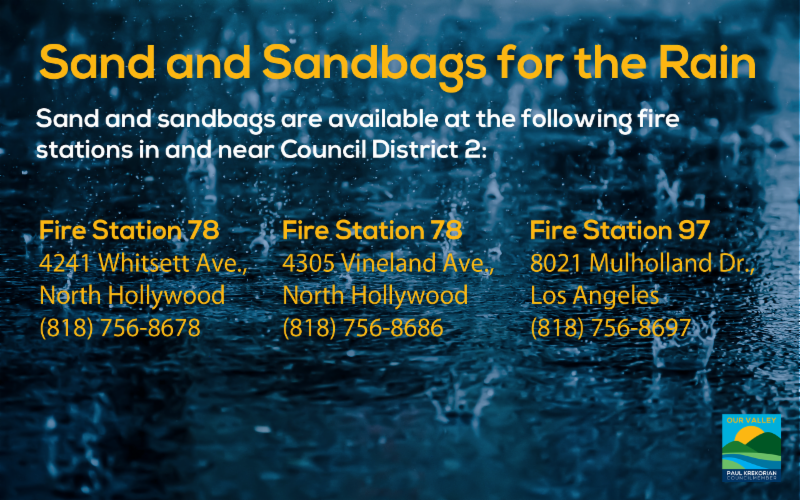 The Los Angeles Fire Department and Bureau of Street Services are making ready-to-fill sandbags available at locations citywide. To find a neighborhood fire station or Bureau of Street Services location near you, click here. Call 3-1-1 or use the MyLA311 app to report any street damage caused by severe weather. To report a fallen tree, call the Bureau of Street Services at (800) 996-2489. Please remember to stay away from power lines, dangling wire or anyone or anything in contact with it. Always assume a downed line is still energized. If you experience a power outage, or see a downed power line or electrical wire, immediately call the LA Dept. of Water and Power at (800) 342-5397. LADWP has technicians ready to assist 24/7. The Bureau of Sanitation has already cleaned the city's 40,000 catch basins, 70 debris basins, and cleared drainage channels to allow stormwater to flow properly. To report a blocked storm drain or catch basin, call the Bureau of Sanitation at (800) 773-2489. The Customer Care Center will remain open 24/7 to receive customer requests. Lastly, the Los Angeles Homeless Services Authority has opened its winter shelters for homeless individuals and will keep them open for an additional month from through Mar. 31, 2016. Click here for more information. Please stay calm and safe and get prepared during this extreme weather season. If you have additional questions or concerns, please feel free to email paul.krekorian@lacity.org or call our City Hall office: (213) 473-7002 or our North Hollywood District Office: (818) 755-7676.